Why make stuff with our kids? 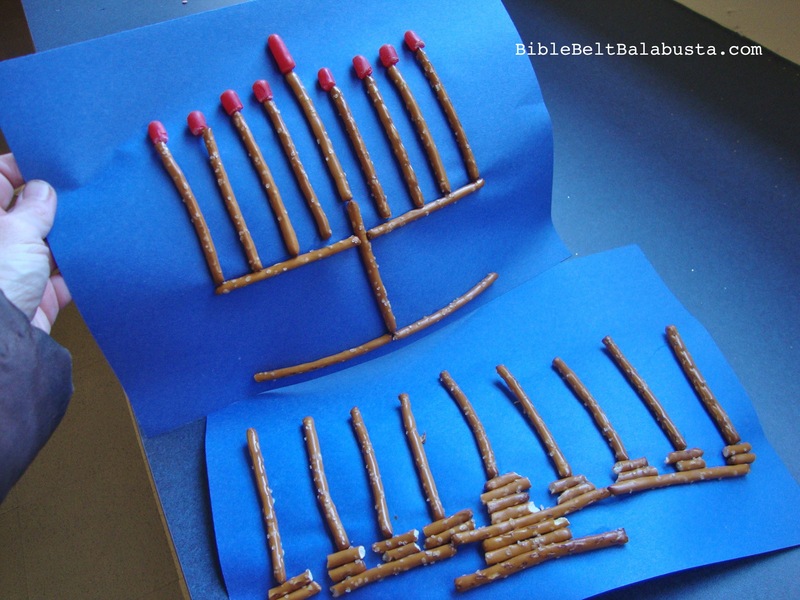 The ol’ Pretzel Stick Menorah is a quick and easy activity for a class or party. It’s educational, it’s fun, and you can eat it. I did this last year with K through 3rd grade, and everyone loved it, which is a boast I wish I could make about all my lesson plans. First, we turned off the lights and lit a real oil menorah, with blessings. This put everyone in a receptive mood and gave a heads-up that there are such things as menorah blessings. It also provided a real, working model of an object we were about to recreate with food, WHICH IS ABSOLUTELY KEY. Kids need concrete reference points when they dally in abstractions. The oil menorah also led to an unexpected discussion about oil vs. candles and when Jewish holidays begin. It was news to even a lot of the older kids that our holidays begin at sundown. Next: I mentioned how the Talmud says to “publicize the miracle” by putting a menorah in a window, so passersby can see it. Thus, the window for our Edible Menorah is a piece of dark blue construction paper. Contrast this with just trying to fit the project on a paper plate. The window—a dumb piece of paper—adds context, meaning. One kid asked for black, because in his scenario, the sky was overcast. Win! The point isn’t to be the Kosher Police, it is to generate discussion and critical thinking. Some of my students ended up with menorahs no Rabbi would endorse, but did I point this out? Not after the frosting solidified, no. While the kids still fiddled with dry pretzel sticks, I might have asked them to re-count the branches or to make sure the Shammash was a little more “different,” yes. Some put the Shammash to the left, the right, in the middle, higher. Small, flame-colored candies (Hot Tamales, Mike ‘n’ Ike, jelly beans, candy corn) or for the candy-averse/allergic: drained mandarin orange slices. 1. Kids count out 8 pretzel sticks plus one for the Shammash. 2. Design the menorah. Will the Shammash be to the side or in the middle? Will the menorah be flat or have a stand? 3. Dab frosting onto one side of each pretzel stick and press to paper window. 4. Kids count out 9 flames and light the menorah. (EDIT: We did this project again today and one student insisted on making a menorah that “stood up like real.” I was impressed. But my materials were not suitable for 3-D construction: Pillsbury frosting isn’t stiff enough to let whole pretzel sticks stand upright. However, where there’s a will, there’s a way. 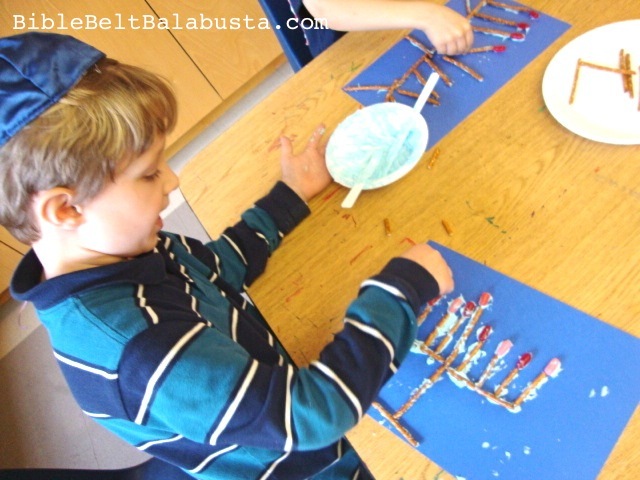 This entry was posted in Activity, Edible Craft, Hanukkah and tagged chanukah, food, menorah. Bookmark the permalink. © Bible Belt Balabusta by Joanna Brichetto, 2008-2015. Unauthorized use and/or duplication of this material without express and written permission from this blog’s author and/or owner is strictly prohibited. Excerpts and links may be used, provided that full and clear credit is given to Bible Belt Balabusta and Joanna Brichetto with appropriate and specific direction to the original content. 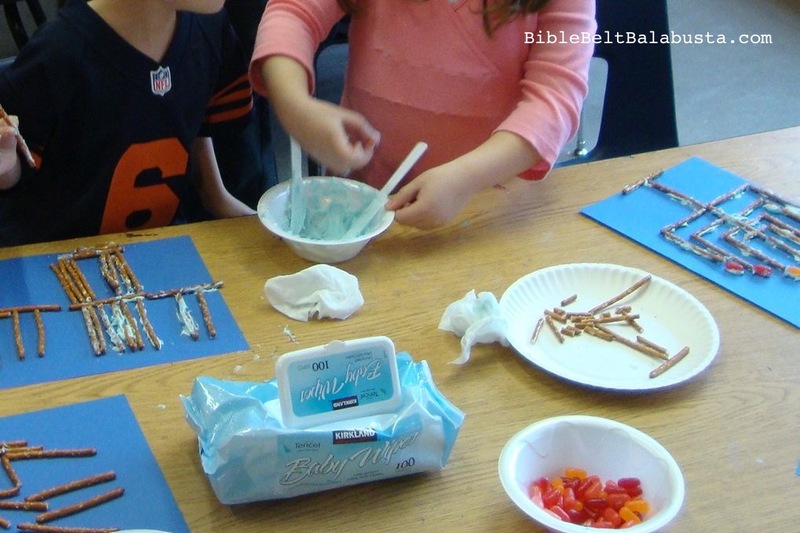 My goal is to help kids and grownups spend time together making Jewish things. I like stuff that is hands-on, attractive, non-fussy, cheap and real, and so fun no one realizes it's educational. The value is in the doing, not just the being done, and in the conversations and questions that happen along the way. Every project comes with helpful and (hopefully) pleasant chatter, because my native compulsiveness and enthusiasm means that I’ve given the meaning, function, and possible permutations a lot of thought. You won’t need to do much planning, because I’ll have done it for you. Balabusta, n. (bal-eh-boos’-teh) Yiddish for female boss of the home, a praiseworthy Jewish homemaker. Bible Belt, n. where I am, and where most Jews aren’t. It doesn’t matter if you don’t live in the Bible Belt. The geographical modifier is a flag to indicate that the author is used to being outnumbered, without resources, and thus able to do just about anything from scratch. Newbies welcome. I used to be one, long ago. Nanoblock menorahs for LEGO minifig first night of Hanukkah.